We are so excited that Glenn Close has returned to the role of the glamorous Norma Desmond in Andrew Lloyd Webber’s beloved musical Sunset Boulevard, the same role that won her great praise and a Tony Award a little over 20 years ago. In honor of this remarkable actress and her encore, we have compiled a list of our favorite Close encounters. Glenn Close brought one of the best Disney villains to life in the 1996 live-action adaptation of the classic animated movie 101 Dalmatians. Her perfect mix of glamour, insanity, and, well, cruelty made for a memorably evil performance in the popular children’s film. Though her take on Cruella de Vil is more hilarious than scary, Close’s deliciously devilish laugh is enough to send shivers down your spine. What do you get when you combine one of the greatest composers of all time with one of the greatest modern actresses? Why, a show-stopping performance, of course! Glenn Close performed the Sondheim favorite “Send In the Clowns” at the 1992 concert Sondheim: A Celebration at Carnegie Hall. When Tina Fey and Amy Poehler hosted the Golden Globes together for the first time, they did not shy away from calling out nominees and members of the audience during the course of the night. Close, who was nominated that year for her leading performance on the hit television series Damages, did not miss a beat when the comedic duo called her out for having a little to much fun at the awards show. 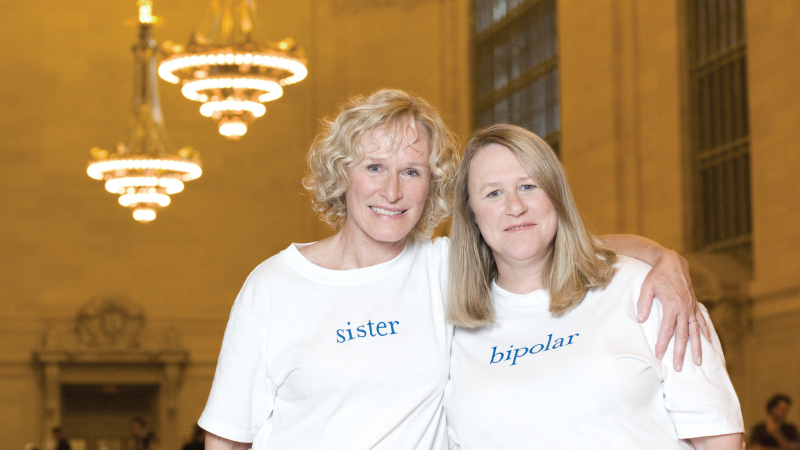 Glenn Close and her sister Jessie, who was diagnosed with bipolar disorder in her late 40s. In addition to being a multitalented performer, Close is also a philanthropist and activist. Her charity Bring Change 2 Mind works to bring an end to the stigma surrounding mental illness. Of course, this list would not be complete without mentioning Glenn Close’s epic performance at the 1995 Tony Awards. Close brought down the house with her stunning portrayal of fading film actress Norma Desmond remembering better times in the song, “As If We Never Said Goodbye.” That night, Close would take home the Tony Award for Best Performance by a Leading Actress in a Musical. Now you can witness this performance live as she takes the stage again in the current revival of Sunset Boulevard. Save on tickets to see Glenn Close in this not-to-miss revival through TodayTix and let us know what you think on Facebook or Twitter.